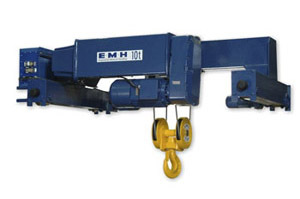 Engineered Material Handling (EMH) sets the standard for wire rope hoists. 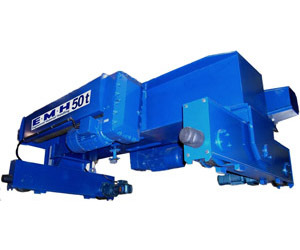 EMH manufactures its own single and double girder wire rope hoists for manufacturing and industrial applications, with lifting capacities from two to 50 tons. 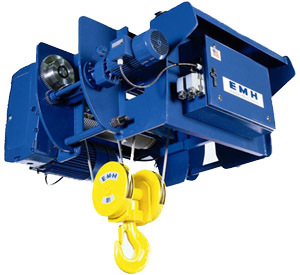 EMH hoists provide a price to performance ratio that sets the standard for the best the industry has to offer and is why it is a go-to product for Acculift in larger lift applications. Features include two lifting and trolley speeds, two upper and one lower precision limit switches, overload limit, heavy duty wear resistant rope guide, DC rectified brakes, and lifetime lubricated bearings and gear reducers. There is a different EMH configuration for each bridge configuration.